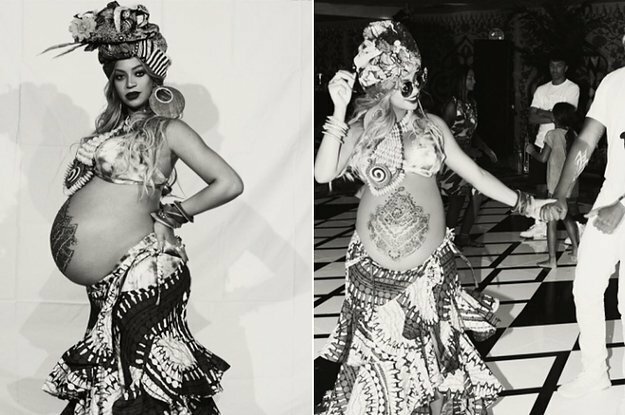 Recently, Beyoncé lit up the Internet (again) by sharing pictures of her African-themed “Carter push party” to celebrate her pregnancy. Pictures posted on social media showed Queen Bey decked out in African attire with her husband, Jay Z. Fans were quick to notice Beyoncé’s nod to African culture, but it’s not the first time the superstar has paid homage to the continent — in particular Nigeria. From her videos and stage performances to her clothes and use of words, here are five times Beyoncé has referenced Nigerian culture. 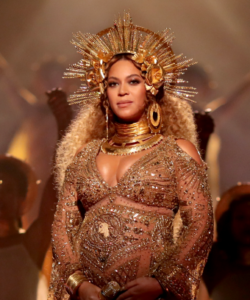 For her first appearance since her pregnancy announcement, the singer wore a striking gold ensemble paying homage to Oshun, an important deity in the Yoruba religion. Oshun, who adorns herself in gold ornaments, is the goddess of fertility, motherhood, love and beauty. After her pregnancy announcement — which quickly became the most liked Instagram post of all time — Beyoncé released a photo series called “I have three hearts,” words from a poem by Somali-British poet, Warsan Shire. The poem explicitly references Yoruba goddesses Oshun and Yemoja (also called Yemaya), a deity of oceans and motherhood. Both deities are known for their connection with water. The photos that accompany the poem show the superstar underwater wearing light marigold yellow fabric, a color associated with Oshun. Beyoncé’s most talked about album has been hailed as a celebration of African culture and Nigerian influences are weaved throughout. In the video for “Hold Up,” the singer is wearing a marigold-colored ruffled dress as she opens a floodgate. Later in the video she smashes a car window and a fire hydrant in her path with a baseball bat. Oshun, whose color is marigold or yellow, is known as the mother of sweet things who unleashes her wrath when angered. Yoruba visual artist Laolu Senbanjo’s intricate body paintings are featured in the video for “Sorry,” another song on the “Lemonade” album. The video shows Beyoncé and her dancers adorned with artist’s signature white body paint. Senbanjo calls his art — which is founded on a Yoruba religious practice — the Sacred Art Of The Ori. “In my language, Yoruba, ‘Ori’ literally means your essence, your soul, your destiny and also comes with a mantra,” he wrote in a statement on his website. This isn’t a deliberate nod to Nigerian culture, but Queen Bey is pregnant with twins, or ibeji as they are called in Yoruba, which is of particular significance in Yoruba culture. The Yoruba have one of the highest twinning rates in the world and twins — which are traditionally named Taiwo and Kehinde — are seen as a special blessing.